With Apple chief designer Jony Ive and retail head Angela Ahrendts collaborating on major changes to their company's retail experience, a first glimpse of what's to come may debut at a relocated Apple Store near Memphis, Tenn., it was revealed this week. Apple's current Saddle Creek store in Germantown will move, if the project is approved. Early plans for the new store, located to the east of Memphis, were approved by the local design review commission last week, according to the Memphis Daily News. 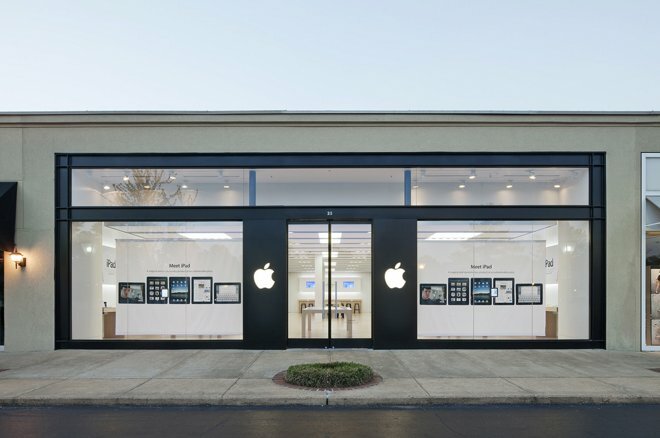 In his presentation, Apple representative Rick Millitello called the project "the next generation of retail store that we're rolling out," saying it would be one of the first of its kind in the U.S.
Apple's current Germantown store was the 20th retail outlet ever opened by the company. "We're really excited because this is going to be one of the first, if it's approved, that we build," he said. "So we're really excited to expand in Germantown and we're excited to see the result of all the work that we've put in to develop this system." The current Germantown location is one of Apple's oldest retail stores. 512 Pixels, which was first to discover the report, noted that the Tennessee Apple Store at Saddle Creek was the 20th opened by the Mac maker overall. Millitello described the new retail design as having"a matte granite reinforced panel on the exterior wall as well as natural oak tables inside," the Daily News said. The storefront is expected to have a changeable display with living plants, TV displays, artwork, and more. It will be located inside the same shopping center, at a new location. Back in February, it was revealed that Ive and Ahrendts are working together on a complete overhaul of Apple's retail stores. The two apparently hope to utilize a different approach than the past, making the stores better suited for selling the fashionable Apple Watch. Ive was recently named Apple's Chief Design Officer, a role which will see him relinquish day-to-day oversight of industrial design, allowing him to take on a wider array of projects. Among the tasks in which Ive will take on a greater role is the redesign of Apple's retail stores. Subtle changes to Apple's retail experience have already begun to take effect. For example, in July Apple Stores began carrying products with new retail packaging with a "premium" feel co-designed by Apple itself.